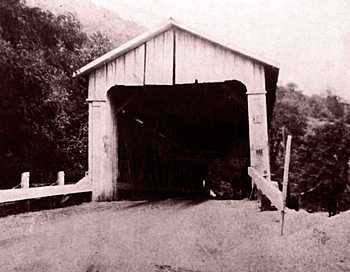 The old covered bridge was near the Hammondsville School and spanned the Big Yellow Creek. 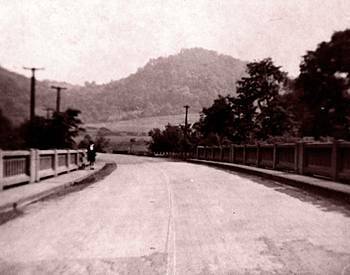 It was later replaced by the concrete structure (below), which carries Ohio State Route 213 over Yellow Creek. Thomas Hammond came to Ohio from Virginia in 1820. He was about 20 years of age then. While in Ohio he purchased 3000 acres of land in Jefferson County for a farm. On this land was a settlement situated where the town of Hammondsville now is but it was not named then. In 1849, he built a house at the foot of Somerset Hill and after a number of years sold it to a Mr. Morse. The bricks used in the house were made in the field above it. It has large rooms with high ceilings. In the early 1900's it was owned by J.L. Call, now his daughter and son-in-law, James Parsons live there, farming and operating a dairy . He had a son, Thomas G. Hammond, living in Hammondsville, with whom he lived until his death in 1867. Soon after his father's death, Thomas G. Hammond, his wife, Emma Wallace Hammond, their two sons, William and Edward, and his widowed mother, moved to Wellsville. After their mother's death on January 2, 1871, William and Edward Hammond returned to Hammondsville and lived with the Wallace Family in their grandfather Thomas' brick house. Here they remained for three years and attended the Hammondsville School. At this time, (1950), William Wallace Hammond resides in Indianapolis, Indiana, where he has been a leading attorney for a number of years. In May of this year he was 86 years of age. His brother Edward resides at Cleveland, Ohio. He was 84 in March of this year. For a lot of folks this picture will bring back many memories of the days when the teachers taught the ABC way. A new school was built in 1928 to replace this building. W.H. Wallace was born near Montreal, Canada on December 2, 1811. He came to the United States with his father, Sir George Wallace, and for a time lived in Baltimore, Maryland. While here he clerked in Wanamaker's Department Store. He then later moved to Lisbon, Ohio then to a settlement below Yellow Creek, where he built a store of his own. He named this settlement, Port Homer, after his son, Homer Wallace. There was a prospect for a better business farther up Yellow Creek that appealed to Mr. Wallace, this was a small settlement that had no name. Here he improved an old warehouse and opened a store in 1844. 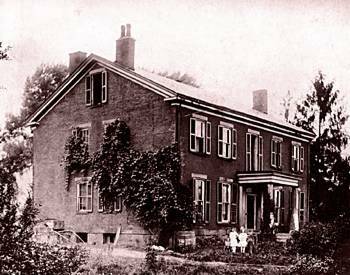 He then lived in a frame house, called Wards House, built c.1842, at the foot of the Somerset Hill Road. Here Mr. Wallace lived when he opened his store. It was built in 1842. This house became the home of the Marion Elliott family in the late 1880's. The Elliotts found many arrowheads as they plowed the land for farming. He had to go to New York to purchase some merchandise and on this trip, he and his wife were faced with the problem of where to have the supplies shipped. [This town was not named then.] At New York, his wife suggested the name, Hammondsville, and gave the location as four miles above Yellow Creek, and so it has remained until now. 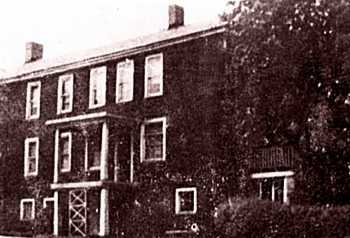 Later Mr. Wallace moved from the frame house to the hotel then known as the Downer House. After that, in 1864, W.H. Wallace bought the Hammond House, and moved into it. The family then consisted of W.H. Wallace and his wife, his son, Homer, and his wife, son Rodney and wife and daughters, and son W.H. Jr. This hotel was built in 1852. It was first known as the Downer House, later it was owned by Wallace, Robenson, Patterson, and Lawrence, in that order. Rich deposits of coal and clay were discovered on the Hammond land and W.H. Wallace and his sons, Rodney and William developed these interests in connection with their store. 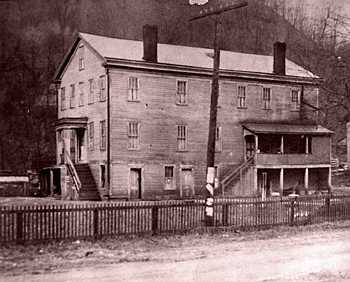 When the Cleveland and Pittsburgh Railroad was built through this town in, 1852, they mined and shipped large quantities of coal along with coke and brick. The warehouse then housed the Post Office, Express Office, Freight Office, Tailor Shop, Grain Elevators and a General Merchandise Store. The farmers for many miles around shipped their wood and grain from this point. There were also several salt wells which were doing an equally good business. One was located in the town and the others farther off in the adjacent valleys. Later on there was a stone quarry for pulp mill stones, some of which can still be seen near the railroad. There always has been gas and oil wells around this town and some are still in use for oil. Adapted from the Hammondsville 100th Anniversary Souvenir Book. Copyright 1950 D. D. O'Tool, Used by permission.